January 27 is the anniversary of the 1910 death of Sir Thomas Crapper, one of several individuals upon whose name posterity defecates. Mention that you are writing a book on notorious eponyms and you will likely receive a yawn, a condescending eye roll, or an excited outburst that Sir Thomas Crapper invented the flush toilet. The first two responses demonstrate that there is just no accounting for some people’s taste, while the third reflects the remarkable staying power of a satirical pseudobiography that launched one of the most ubiquitous urban legends in history. Let us make several things clear. Thomas Crapper most certainly did not invent the toilet, but it might be possible that we invoke his namesake when we ascend the porcelain throne. Wallace Reyburn was a war correspondent, magazine editor, and humorist who wrote a good many books in his life, some more serious (and factual) than others, but 1969’s tongue-in-cheek Flushed with Pride: The Story of Thomas Crapper and 1971’s teat-in-sling Bust-up: The Uplifting Tale of Otto Titzling and the Development of the Bra proved to be swallowed whole by a generous portion of their readership. Despite the rampant puns in the latter “bra-ography”—including an assistant named Hans Delving and a female athlete named Lois Lung—the completely fictional Titzling eventually became a supposedly real answer to a Trivial Pursuit question. Meanwhile, Flushed describes Crapper’s good friend “B.S.” and the “many dry runs” required to perfect the “Crapper W.C. Cistern.” People have been spouting this satire as fact for the last forty years. The truth is that Thomas P. Crapper did exist. He was a British plumber, born around 1836, who owned his own plumbing company and widely popularized flush toilets, but his connection to modern word usage is somewhat murkier. Certainly the word crap, derived from the Dutch krappe, precedes him by centuries, first appearing in English in 1440. Likewise, the prototypes and early patents for our modern flushing toilets are generally attributed to Sir John Harrington at the end of the sixteenth century and Alexander Cummings in the 1770s, decades before Crapper created his first movement. But Crapper’s company in London did pioneer the use of the floating ballcock (to avoid overflow) and outfitted several royal lavatories including those of Edward VII and George V. The resourceful Crapper was never knighted for his contributions, however, as is often alleged. While fanciful anecdotes and jokes abound, it is still possible that our use of both crapper and crap are connected to the British plumber. 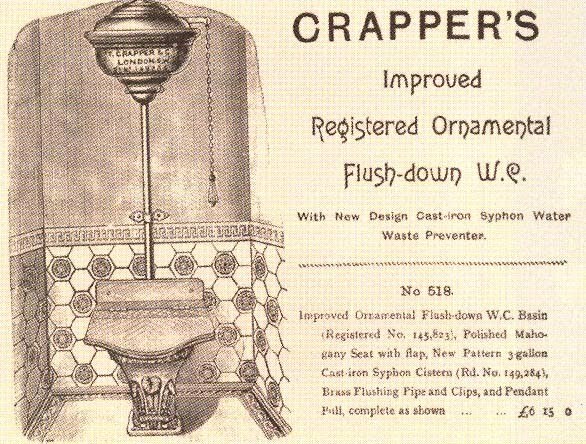 Crapper first appears in the Oxford English Dictionary as a privy in 1932 in American usage, and crap is not used to mean defecation until 1937. 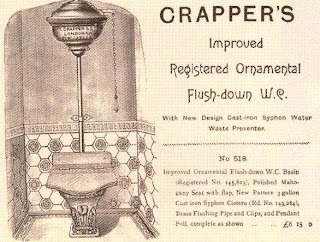 One prevailing theory is that American soldiers serving in World War I traveled to Britain and spent a fair amount of time staring at “Thomas Crapper & Co. Ltd.” fixtures while dropping personal bombs and brought Thomas’s namesake back to the United States. Crapper thus slowly entered the lexicon over the next decade. Meanwhile, the name’s close connection to the contents carried helped transform crap (a traditional word for chaff, residue, and rubbish) into its stinking incarnation today. Crapper himself retired from the crapper business in 1904 and is immortalized on a series of manhole covers in Westminster Abbey. He passed in 1910. Yet while Crapper’s offal association might be debatable, there is a solid quartet of historical heroes who share the dubious distinction of having their names (and, sometimes, faces) directly conjoined with voiding vessels. Because only vespasienne appears in modern usage (Oxford English Dictionary), all have been relegated to footnote status here. In chronological order, our first stop on the Excrement Express is Italy. One year after Nero committed suicide in AD 68, the great military leader Titus Flavius Vespasianus (generally referred to as Vespasian) became Emperor of Rome. His primary goal seemed to be to institute new taxes, wherever possible, to fill the royal coffers and fund his grand new ventures—including construction of the immense Colosseum, which would not be completed until his son’s rule. One of his most creative moneymaking schemes was a “urine tax” imposed on public facilities. To maximize his supply-chain loop, he sold the collected urine to launderers, who aged it in giant vats (until it converted to ammonia) and then used it for bleaching. Italians henceforth called urinals vespianos, leading to the French vespasiennes, which was then absorbed into English. Vespasian was relieved of his mortal strain in AD 79 when he died of a diarrhea-racked fever. Roughly 1,500 years later in England, a civil war over haircuts and political succession was under way. The short-haired, Parliament-supporting Roundheads were facing up against the curly tresses of the monarch-loving Royalists. The Roundheads ultimately won a victory in 1651 that would eventually establish a parliamentary monarchy 150 years later, but short-term leadership of the country fell to the alternately revered and reviled Oliver Cromwell. 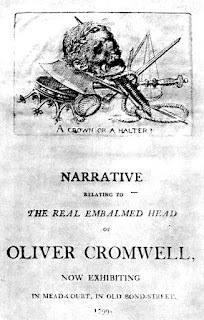 While soothing their wounds from their military losses over a few pints, the Royalists drunkenly stumbled across the hilarious notion of dubbing their chamber pots Oliver’s skulls. The slang stuck well into the 1800s. Cromwell himself died in 1658 (somewhat ironically) from a urinary tract infection. Three years later, after the Royalists had returned to power, his buried body was exhumed, hanged at Tyburn, thrown in a pit, and then beheaded. His head was then placed on a spike above Westminster Hall. Details on the subsequent journeys of the head are mysterious. 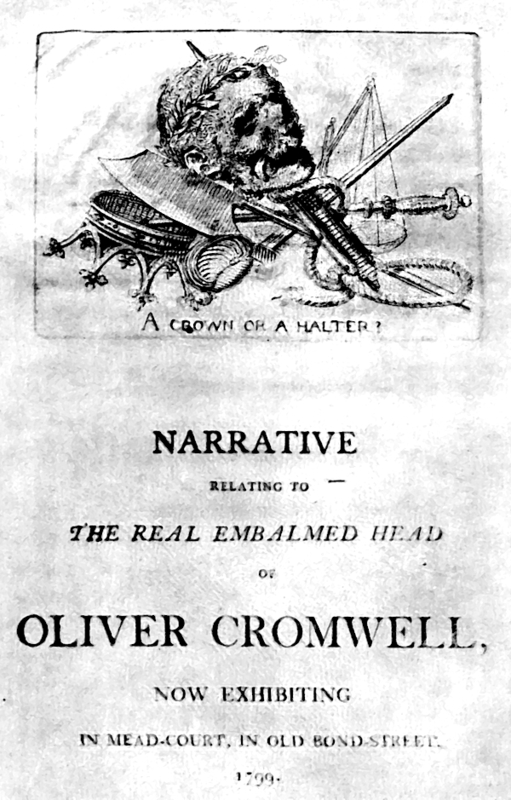 However, in 1799, what was believed to be the head was sold to three brothers named Hughes who set up an exhibit of Cromwellabilia. Despite an extensive marketing campaign, the exhibit was a failure, and the provenance of the head has been in question ever since. Political tensions were not much relieved in the decades that followed, and soon the divine-right-of-kings-supporting Tories and the crown-threatening Whigs were at each other’s throats. In 1709 ardent Tory and clergyman Dr. Henry Sacheverell successfully pissed off the entire Whig party in a series of sermons that accused the Whigs of being too tolerant of religious dissenters. His fomenting language initially led to his short suspension from preaching and an entry in the Oxford English Dictionary as a synonym for a stove blower, the implication being that he was famous for “blowing the coals of dissension.” However, more germane to the topic here, his name also became synonymous with chamber pots after several resourceful Whigs managed to manufacture the common household items with a portrait of Dr. Sacheverell painted on the bottom. Upon the learned Doctor Twiss. As an editorial footnote to these etymological footnotes, any reader now inspired to sully the most extraordinarily large urinals east of the Mississippi River needs only swing open the saloon doors of the Old Town Bar in New York City, home to the grand porcelain towers of the Hinsdale Company, whose magnificence dwarfs even the mightiest sword. In contrast, the Old Town’s crappers are nothing to speak of.